Former IBF middleweight champion David Lemieux may have admitted to passing on Saunders, but that is because he wants to fight Miguel Cotto! 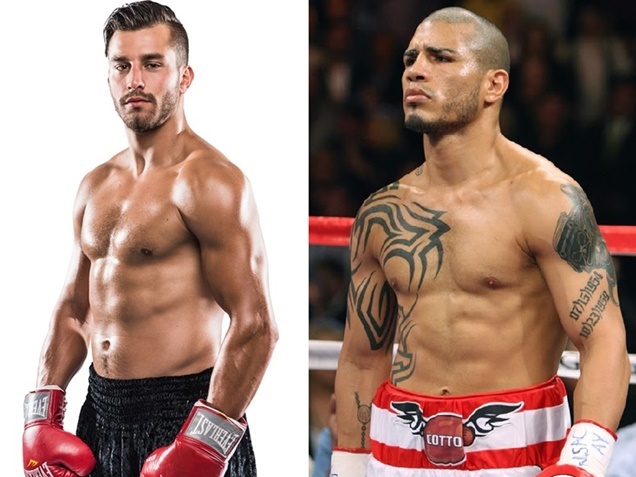 LatinoAthlete.com has learned that David Lemieux (38-3, 33 KOs) has eyes on Miguel Cotto for his next fight. Now that he has a green light from his doctors to resume training he can finally return to the gym. If you recall, David Lemieux tore his shoulder and a left hand he sustained in his last fight against Marcos Reyes (35-5, 26 KOs). During that fight David Lemieux used his powerful left hook, the same one that knocked Curtis Stevens unconscious, pounding Reyes from the opening bell. The fight was part of the Canelo Alvarez vs. Julio Cesar Chavez Jr. undercard. Fast forward to now, Lemieux, who has already delivered 41 professional fights at age 28 feels there is a bigger fight for him, and that is Miguel Cotto (40-5, 33 KOs). Cotto is currently training for his fight against Yoshihiro Kamegai for the vacant WBO junior middleweight title on August 26th at the StubHub Center. Lemieux plans to be ringside to watch Cotto fight Yoshihiro. He will also be there to confront Miguel and most likely challenge him to a fight especially since both boxers are signed with Golden Boy Promotions. Earlier this year Miguel signed a multi-fight deal with Golden Boy Promotions, so this will be a perfect opportunity for David Lemieux to get a rise and see if he can mussy up a fight.